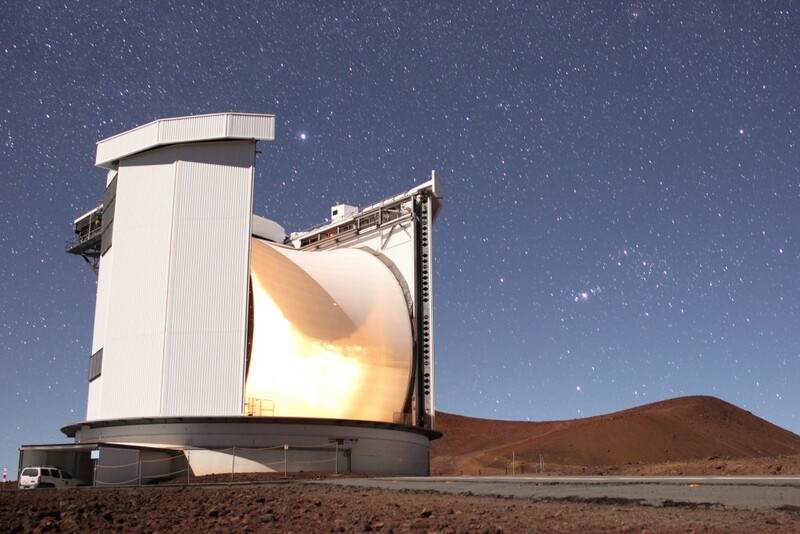 With a diameter of 15m the James Clerk Maxwell Telescope (JCMT) is the largest astronomical telescope in the world designed specifically to operate in the submillimetre wavelength region of the spectrum. The JCMT is used to study our Solar System, interstellar and circumstellar dust and gas, and distant galaxies. It is situated at approximately 19°49’22.2″N 155°28’37.0″W close to the summit of Maunakea, Hawaii, at an altitude of 4092m. The 15-metre diameter primary reflector of the JCMT is made up of 276 individual lightweight panels. Each panel consists of a thin aluminium skin pressed into and bounded onto a rigid foam panel. The panel is attached at three points to the backing structure of the antenna. The alignment of the mechanical panels can be adjusted by means of stepper motors at the mounting points. The backing structure is designed to maintain a parabolic figure as gravity distorts the antenna as it tips to different elevations. The surface accuracy is routinely measured and has a typical value of 24 micron. Adjustments required to each panel are calculated by making observations of a coherent millimetre source located in the UKIRT building. The sub-reflector or secondary mirror can be adjusted in three axes to compensate for changes in focus as well as changes in the figure of the primary. In addition, the secondary can be tilted or chopped in two axes in order to perform sky background cancellation. The rms pointing accuracy of the JCMT is about 2 arcsec in Azimuth and Elevation. Typically every hour a local pointing source is observed. The JCMT carousel co-rotates with the antenna and is designed to protect the telescope from the elements and to provide a safe and comfortable working environment for astronomers and engineers. An important feature of the carousel is the membrane which is deployed in front of the antenna at all times and is transparent at millimetre and submillimetre wavelengths. In addition to providing protection from the wind, the membrane performs the useful function of reflecting the visible and near-infrared radiation, providing protection from the solar heat which could damage the antenna, thereby allowing daytime astronomical observations including direct observations of the Sun itself. Receivers for the telescope can be located either in one of the bays of the Cassegrain cabin or on the two Nasmyth platforms located at the ends of the elevation bearing. A number of receivers can be and are accommodated on the telescope at the same time and are selected by a movable tertiary mirror located in the centre of the Cassegrain cabin. The heterodyne receivers, covering the atmospheric windows between 215 and 680 GHz, are mounted in the cabin while the continuum bolometer array instrument, SCUBA-2, and the heterodyne array receiver, HARP, occupy the Nasmyth platforms.